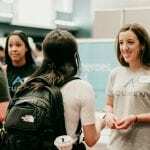 San Jose State students met with prospective employers from high-tech firms and other companies had the career centers stem job fair on Sept. 18 and 19. Students line up to meet with regional employers at an on-campus job fair. San Jose State University students made such an impression on Harold Mann, a recruiter for Mann Consulting who attended a STEM Career Fair hosted by SJSU’s Career Center this week, he took to LinkedIn to praise the soon-to-be graduates who were seeking employment. He noted the professionalism of the students, their preparation of resumes specific to his company rather than a generic photocopy handed out to multiple employers, and the background research students did before lining up to speak with him at the job fair to better understand his company and its needs. “Sure, we saw a few skateboards and tee shirts, but the overwhelming takeaway was that this was a professional, motivated, humble and polished group of students,” he wrote. 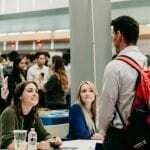 Catherine Voss Plaxton, director of SJSU’s Career Center said the staff offers several well-attended Job Fair Success workshops, along with several other forms of on-going career education. “The behaviors described by the author of the article represent the exact direction we give to students regarding preparation,” she said. SJSU’s Career Center has hosted several jobs fair so far this semester including an on-campus/part-time job fair, a business and government job and internship fair, and this week’s a STEM undergraduate and graduate fair. For a list of upcoming activities and job fairs, visit the Career Center online.